One of the countries in Europe you must visit is Russia. Russia became the largest country in the world whose area stretches across two continents of Asia and Europe. There is no doubt that Russia has a truly beautiful tourist spot. Such as Moscow Kremlin, Mount Elbrus, Geiser Valley, Winter Palace, Peter and Paul Fortress, Red Square, Peterhof Palace. There is Hermitage Museum which is a favorite of the traveler. But not only for the beautiful places, Russia also popular with their cuisine. The next famous Russian meal is pelmeni. The shape may remind you of typical Indonesian dumplings, but this pelmeni has different flavors. Usually, pork, beef, lamb, salmon, or even mushrooms can become the content of pelmeni. Pelmeni can be eaten directly or served with broth sauce. Blini is one of the traditional Russian food. Russians make blini from a mixture of wheat flour, yeast, and milk. The shape of the blini is similar with French crepe that has round and thin shape. Usually blini presented at the wedding or funeral ceremony. A woman who have just given birth are advised to eat this food. This typical Russian cuisine resembles a bakpau, and usually has the same stuff as pelmeni. If you visit Russia, you must try pirozhki. In addition to its delicious taste, its cheap and easy to find anywhere makes this one of Russia’s famous food favorite for Russian society. 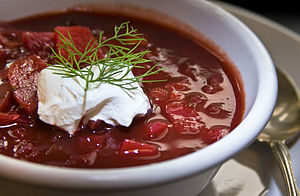 The next most favorite recipes for Russian people is borscht. As winter arrives, this Russian beetroot soup is sure to be the most fitting dish to serve while still hot. Taste unique, tasty and delicious make the borscht menu mainstay Russian citizens to warm the body in winter. One more typical Russian soup that you must try is solyanka. This food has a sour taste and a bit spicy. Generally, solyanka content is fish, meat, or mushrooms. The flavour came from pickles, onions, Russian-style spices, and sour cream. This is a popular type of acid soup in Russia. In Russia, almost everyone likes warm soup. Solyanka is a soup that contains fresh beef, or smoked beef and Russian sausage. In addition to meat, there is also stuffing fish, and mushrooms. This soup will be perfect with cucumber. Khachapuri is a crunchy bread. The shape is like a boat which the middle is given a half-cooked egg and some type of cheese (usually 4-5 types of cheese) are melted. Russian people usually consume this at breakfast and warmly. Shashlik called Russian sate that usually uses pork. However, you can replace it with beef, goat, or anything to taste. This Russian native food is usually served with a variety of spices added red wine, vinegar, or pomegranate juice. Potato okroshka is a soup made from buttermilk, potatoes, onions, and beautified with dill or sash fennel. This Russian native food has a unique flavor. Its is savory and tender, may be similar to cream soup. Khinkali is a dumpling-like food or one of a kind of dim sum. Minced meat and cilantro filling this dumpling. . Although similar to Chinese food, this Russian native food has a distinctive taste of Eastern Europe. Zharkoye is a food that is almost similar to home-based soup in Indonesia. This Russian native food is made from meat, potatoes, and carrots, with seasonings of garlic, parsley, celery, cloves, and dill leaves. This food is easy to make and contains lots of spices, so it is suitable to eat when the air is cold. Knish is an inner pastry filled with mashed potato, minced meat, onions, and cheese. This typical Russian country food is very easy and commonly consumed in Russia, even you can find it easily in almost all regions of Eastern Europe.